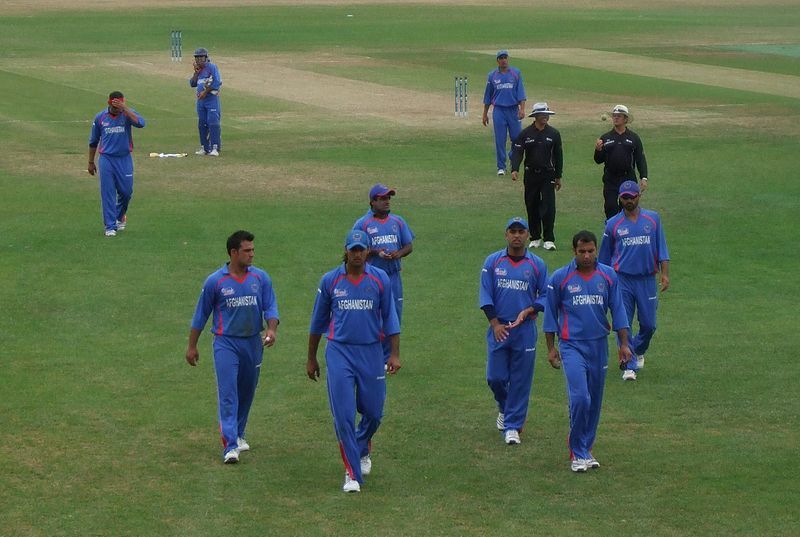 As Afghanistan is embarking on their ODI against Pakistan as I type, I thought I’d have a look at how they’ve evolved, as I’ve heard conflicting stories. Cricket was played in Afghanistan in the 1800s, the earliest recorded match being against British troops in Kabul in 1839 during the Anglo-Afghan wars, but it didn't take off. In the 1990s it was picked up again by Afghan refugees living in Pakistan, and continued to play after their return to Afghanistan. 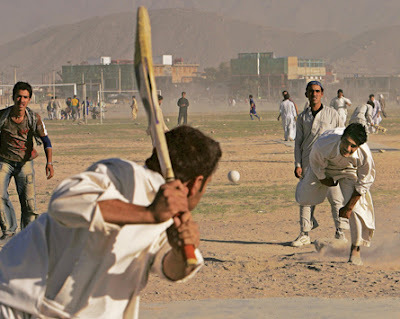 The Afghanistan Cricket Federation was formed in 1995, but within a year the country fell into the hands of the Taliban militia, who banned all sports. Remarkably, in 2000, cricket became the only sport allowed to be played in Afghanistan, as the Taliban overturned the ban for this one exception to all sport. 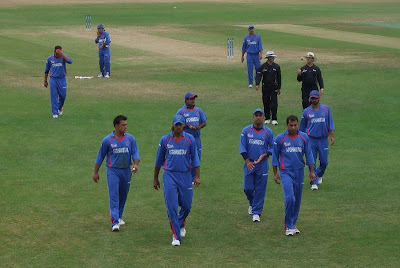 In 2001 a national team was formed and became an affiliate member of the ICC. The team was touring Pakistan when the war in Afghanistan commenced in October. Despite this, they continued playing in tournaments in Asia and the Middle East. In fact, they even defeated an MCC side featuring Mike Gatting, who was dismissed for a duck. Obvious security risks mean their home ground is Sharjah Cricket Association Stadium in the UAE, but have also played home matches in Sri Lanka. The Afghanistan Cricket Board, however, is based in Kabul, and in April 2010 the foundation stone for Afghanistan’s first cricket stadium was laid by the chairman of the Cricket Board (also the country’s finance minister) in Jalalabad. 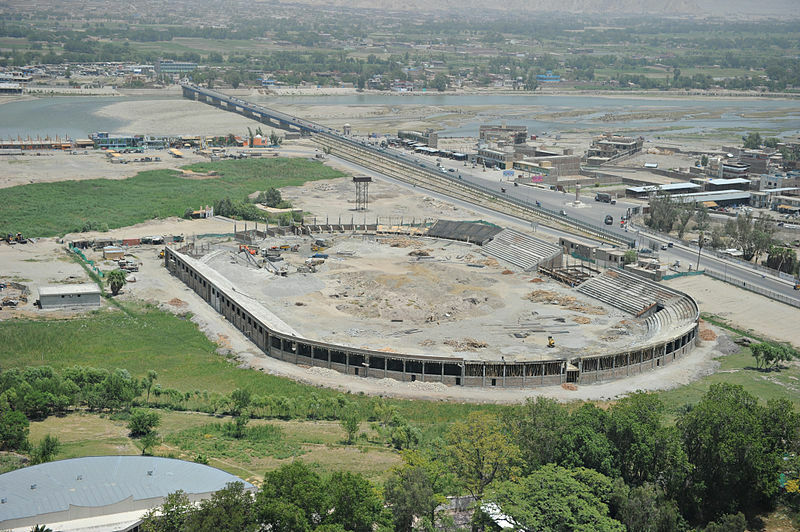 The Sherzai Cricket Stadium was to cost US$5 million and be paid for by the government. It was still under construction in June 2011 when the photo below was taken, and I haven’t been able to find anything more recent. 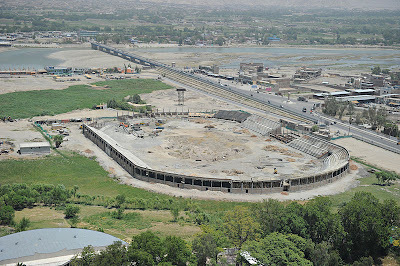 Stadiums are also planned for Kabul and Kandahar, and standard cricket grounds for each of Afghanistan’s 34 provinces were due to be completed in 2012, also with no update on their status. 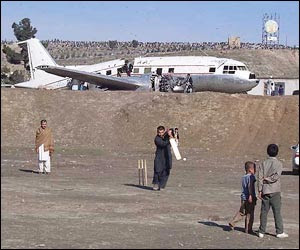 Despite this, there are 320 cricket clubs and six turf wickets in Afghanistan. In fact, there’s even a domestic competition, in which 22 provinces play a 25-over or 40-over format, aiming to make the game's appeal more widespread, as well as develop talent. Crowds of up to 5000 watch these matches. Not without its own politics, the tournament also aims to remove perception that cricket in Afghanistan is played by one tribe exclusively. Maybe most brilliantly of all, in 2010 a national women’s cricket team was formed in Afghanistan. Perhaps unsurprisingly, the team was forced to withdraw from a T20 tournament in Kuwait a year later because of ongoing and strong opposition to women’s participation in sport. Baby steps, but they are steps. Leaps and bounds for the men’s team, on the other hand, who have gender on side. Only four years ago they were in Division 5 of the ICC’s World Cricket League. In 2010 they played in Division 1. Although they failed to qualify for the 2015 World Cup in 2011's qualifying tournament, they were awarded ODI status for four years. Next month they will play in the ICC World T20 Qualifier in the UAE. They are currently ninth in the ICC T20 rankings. The Afghan National Cricket Academy has only four training nets and one bowling machine. Imagine what they could accomplish with the resources that are available to teams like Australia or New Zealand - even Canada. Sure, the gulf between Afghanistan and the top-ranking teams on the table above is enormous (and teams like Bangladesh haven’t played enough to qualify), but their potential equally enormous. In February 2011, the BBC premiered Out of the Ashes, a documentary about cricket in Afghanistan. The film crew had unrestricted access to the team as they travelled to qualifying tournaments around the world. They also visited refugee camps in Pakistan. A book of the same name is also available to buy here. Grassroots cricket success in a country torn apart by war. Are you not inspired? Images via Wikipedia, IndianExpress.com, and afgcric. Welcome back MissField! I have missed you blogs and look forward to reading more. Definitely inspiring stuff this on cricket. The Taliban sent an official good-luck message to their team on the day of the ODI. Goodness heavens! These supposed terrorists bowed down to our great game. This is the unifying might of our beloved game. I am proud to live for such a game! It is great post and very informative and helping post to understand about the history of Afghanistan's cricket. Usually we have a terrorism ans war image of Afghanistan but, i think we should promote and encourage them in all sports. Watched a good documentary about the Afghans on TV not so long back. It will be great to see them in the T-20 World Cup later this year. A cricket match is contested by two teams, usually of eleven players each and is played on a grass field in the centre of which is a flat strip of ground 22 yards (20 m) long called a pitch. Good information to some people. What a great idea! 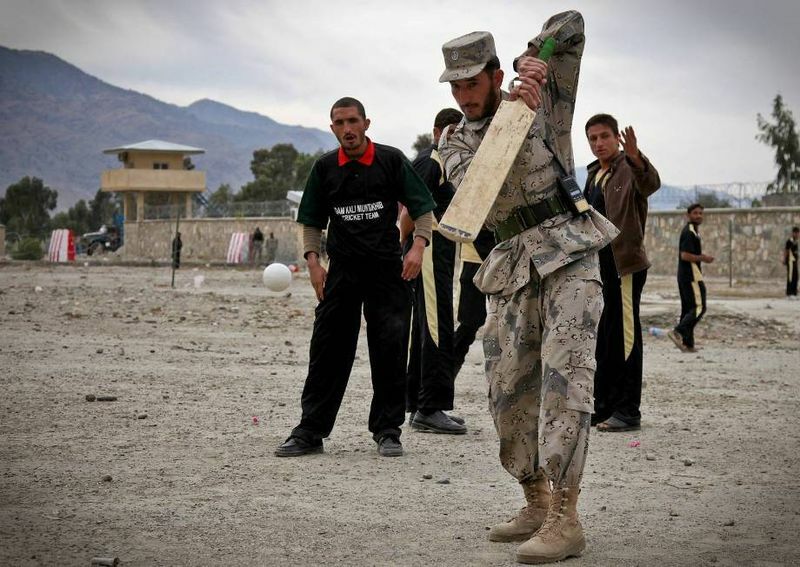 We can send our USN Seal's Cricket Team and have a spot of tea with the Taliban after the match! Cricket become very popular in Afghanistan along with other sports like taekwando,snooker and football. Its good to see Afghanistan is emerging in sports as well. Their people have immense interest in sports and they are great fans of cricket. In upcoming years, Afghanistan will be a strong T20 cricket side as Bangladesh have proved them strong in shorter format. looks great, emerging cricket in Asia. Thanks for nice pic dear. Afghan learned cricket from Pakistan, when they were hosted for decades. It is actual cogent to the depositors of cash within the case of dealing of property where it is in Kolkata or in the other places in India to make sure about the investment in an authentic and ideal property. A very very inspiring story of the cricket evolution in country like Afghanistan where there is always no peace and always a war between different troops.It has been a slow but steady journey thus far for cricket in Afghanistan.I was really amazed by reading your article that Afghanistan do have a women cricket team as well.And also that Afghanistan are 9th in the ICC T20 ranking higher than Bngladesh and Canada and countries like Ireland where much more resources than Afghanistan are available.So it proves that the Afghani people are really very talented. There is a talent in Afghan team. With a rich experience of twenty years in the Real Estate business in Bangalore, we have developed and sold more than 100 Commercial and Residential properties in and around Bangalore. It makes us proud to say that all our esteemed customers are fully satisfied. Wow.. this is the imazing blog Thanks for sharing . I also intrested in it. The real estate is a sector that has now become the most favored business option in any part of India. I have also informtoin about a project, Nimbus Express Park View. Your blog is super healthy. Thanks for the awesome ways you make us sped our time. Fabulous post you have shared here keep it up. awesome post betting tips free. Thanks for sharing this blog about Cricket betting tips. Really your informative blog helpful for Cricket betting tips. Property in Mumbai: Mumbai is the capital of Maharashtra. It is a ground of the Indian film industry. Property in Mumbai is the best and superior place for the house buyers who live with their favorite ones. Find upcoming housing projects in Mumbai. Sell Buy and Rent Flats, apartments, villas and your vision home by dealers, builders and real property owners in your affordable price. The option of loans bad credit no guarantor are in fact reliable and can really improve the financial situation. With flexible repayment term and competitive interest rates, there is nothing much to worry. In the case of long term loans with no credit check, the funds applied for can be accessed without much of any hassle. Besides, the terms and conditions are really designed to suit the prevailing circumstances. Awesome Post, Thanks for share. Get Online Cricket Betting Tips for all international matches. You are doing great job. This is a very useful information for us. thank you for sharing. Thanks for sharing helpful information. I am great cricket lover. I support England team but i respect all cricket teams. I did not expect that the process of availing tenant guarantor loans would be easy. After reading your views, my mind is clear now from all the doubts. Thanks a lot! A todos que partilham e trabalham sob estas mesmas convicções e princípios Friv Friv 360 Friv4school 2020 Senhor Deputado Cashman, agradeço-lhe a informação. Juegos De Roblox Juegos De Zoxy Mais uma vez, obrigada ao Parlamento por comungar da visão que informa a nova política dos consumidores Juegos Kizi 2017 Juegos Yepi 2017 Twizl 3 Zoxy 2 assente no mercado - a visão de um mercado de consumidores informados e capacitados que procuram e usufruem, com confianca. Sr. Cashman, le doy las gracias por esta información. Friv 2019 Gry Friv 2018 Gry Friv 3 n todo momento puede Jeux De Friv Juegos Friv 3 Friv 2019 optar por compartir su información personal con terceros. Juegos De Friv 2019 Juegos Friv 2020 Juegos Friv Gracias por compartir su pasión por el mejoramiento de las vidas de los niños en el Estado de Nueva York. There is no need to visit here and there when you have the option of bad credit loans online. I am one of those persons, who have taken the benefits of these loans with not indulging into too many troubles. I certainly agree with your views on these loans and definitely refer the loans to everyone. Thanks for the wonderful post. Now my mind is clear from all the doubts. With the availability of online lenders, borrowing funds through guaranteed loans with no guarantor option has become easy which ensure quick respite in a difficult period. Besides, the flexible terms and conditions always help in reducing the financial pressure.